The ombudsman in Bolivia lost ALL credibility! Unfortunately, the ombudsman in Bolivia, who was crucial at the time Bolivia was consolidating its democracy, recuperated over 34 years ago, is now a simple acolyte of the coca grower caudillo who intends to perpetuate in power! 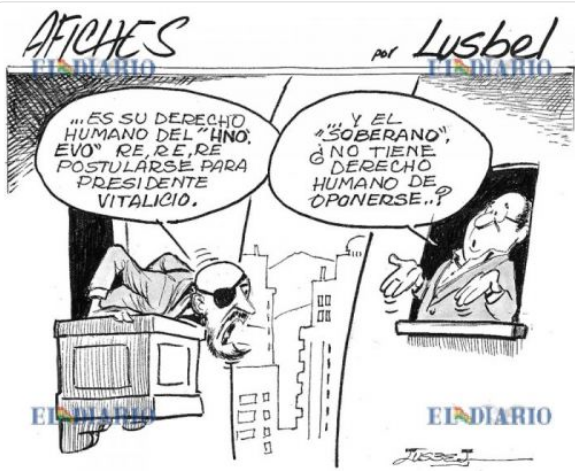 This cartoon is from El Diario, and portrays this individual, David Tezanos, who is trying relentlessly to justify the illegitimate wish of evo, despite him having lost a Referendum that the majority of the people said NO to his fourth nomination to the presidency of Bolivia. While the real sovereign has no human right to oppose? !